The first action of the German A7V tank, on 21 March 1918, is not very well known from the British side. Probably because most of those in action against them were either killed or captured and very little information reached the British authorities at the time. However we now have a German account to work from. Five tanks were involved, from Assault Tank Detachment 1, otherwise Abteilung (Battalion) 1. These were 501, the only A7V female tank, 502, 505, 506, 507 all of which were converted to male tanks but fitted with the improvised trestle mounting for the 57mm gun, the so-called buck-mount. The attack was launched on 21 March 1918, in an area south and east of the occupied French city of St. Quentin. 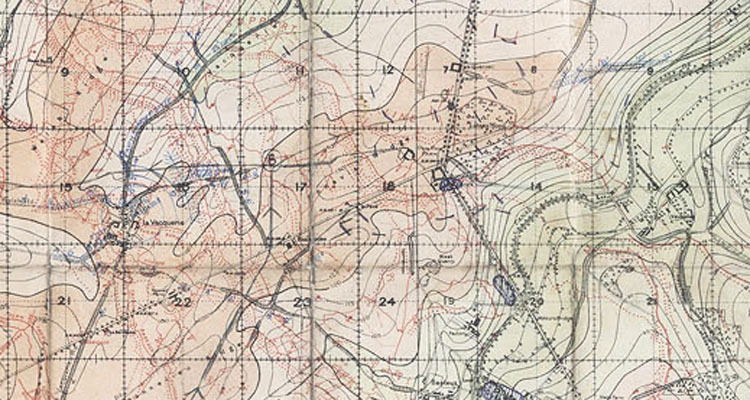 Although it was seen as part of the massive German offensive code-named MICHAEL it was only a small one, five A7V tanks (plus five captured British Mark IV tanks operating in the same area) was not much of a striking force, so a limited action had been planned, on the fringes of the main attack. At the start of the approach march, in the darkness tank No. 502 broke down and had to be left behind. 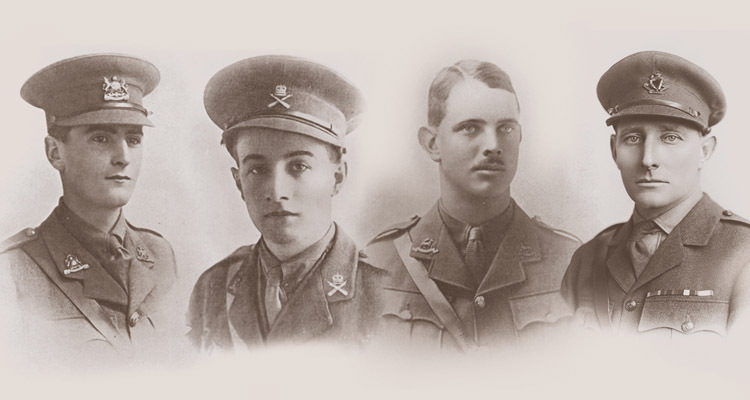 The other four carried on but as dawn came up the tanks found themselves in thick early morning fog, exacerbated by smoke from a prodigious five hour artillery barrage, came down. Now the view from an A7V driver’s position wasn’t good at the best of times, in fog it was almost impossible. By this time they had entered the German barbed wire entanglement on the front line, tank 501 made her way through comfortably and two others, Nos. 506 and 507 found their own way through, but No. 505 got tangled up and broke down, it couldn’t be started again, so now they were down to just three tanks. But lost in the fog Captain Greiff in command of the detachment decided to call a halt until the air cleared a bit and they had some idea of where they were going. 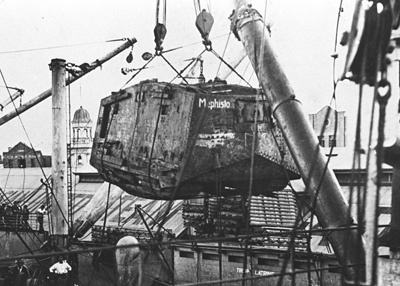 It was around 11.30 a.m. when Greiff ordered the tanks forwards again, visibility was improved. But a bit later on tank No. 507 fell by the wayside. While it was in the barbed wire some piping had been torn away between the rearmost radiator and the right side engine so that all the coolant drained away but a little later on, when clear of the wire a fault developed in the transmission and the tank could go no further. No. 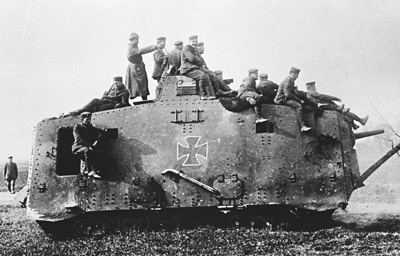 501, the only female A7V, armed with machine-guns. Now just two A7V tanks were left to continue the attack, but what a pair they were. No. 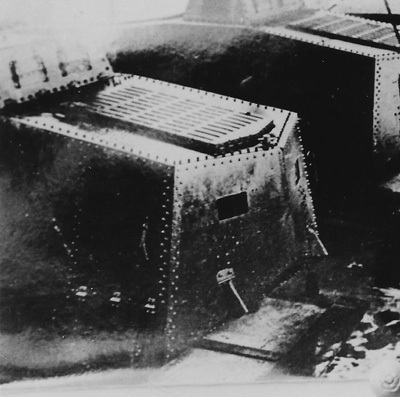 501 was the only female A7V. It would acquire a cannon later and become another male tank, but for the moment it was armed with eight machine-guns instead of six, but for an attack on entrenched infantry that didn’t matter. The other tank was No. 506, a male tank which in due course would be named Mephisto and would finish up being the only German A7V tank to survive, normally displayed in Brisbane in Australia. So the two tanks, the only active survivors of the battalion, carried on. Before long they came up behind their infantry, who they found were pinned down by stubborn defensive fire from the British trenches. 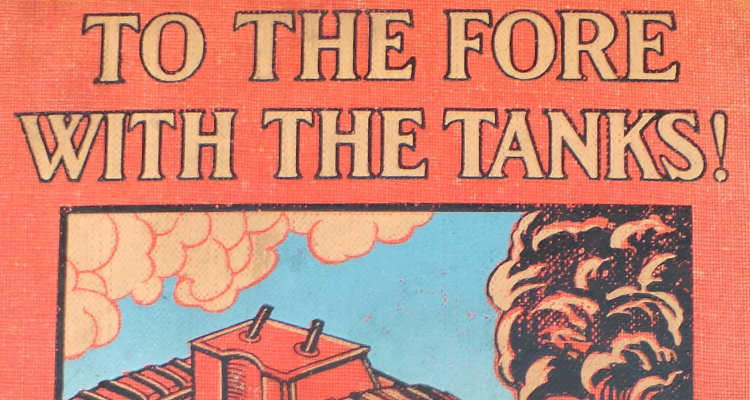 So the tanks took over and led the advance, whereupon they discovered a fundamental truth that affected every nationality fighting on the Western Front. This is that unsupported infantry of either side would not stand up to an attack by armoured vehicles. In this case it was British troops who were on the receiving end, recognising the futility of resisting tanks they either ran way, if they could, or surrendered. They behaved exactly as the Germans had done in 1916 and 1917 in a similar situation. Mephisto, in Australia after capture. The tanks now advanced to a strongpoint known as the Pontchu-Ferme, a fortified farmhouse and encountered another strongpoint that the infantry seem to have overlooked. Described as a fortified quarry it appears to have been a nest of machine-gun and mortar positions supported by infantry, which again held up the German attack until the tanks intervened. Tank 501 is credited with overcoming a number of machine-gun positions while 506 used its 57mm gun to fire grape shot into the quarry. 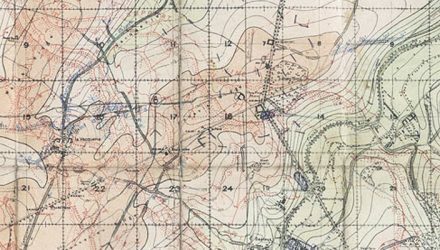 There is no suggestion that either tank actually entered the quarry which may have been uneven ground, but assault troops were sent in and silenced all opposition. It returned with six officers and 150 men from the London Rifles who are said to have been captured. 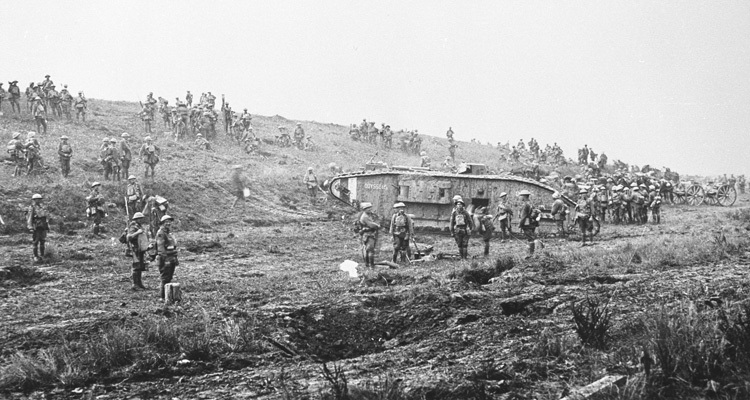 Now the tanks advanced towards their final objective for the day, the so-called ‘Entente Position’ where they came across a similar situation; German infantry held up by intense defensive fire. Apparently 501, the female A7V, carried a pair of short-range portable flamethrowers that the crew were trained to use in the dismounted assault role, so they were deployed. This time the tanks attacked from the flank and cleared the trenches so that before long the ‘Entente Position’ was in German hands. By this time the build-up of heat and fumes inside the tanks had reached alarming proportions so the tanks were halted and ventilated. Having gone as far as they were expected to go they remained in attendance for the rest of the afternoon in case of a counter-attack and only departed to make their way back to their own lines when released by the infantry. The A7V was a promising start from a nation that would come to lead the world in tank design twenty years later. 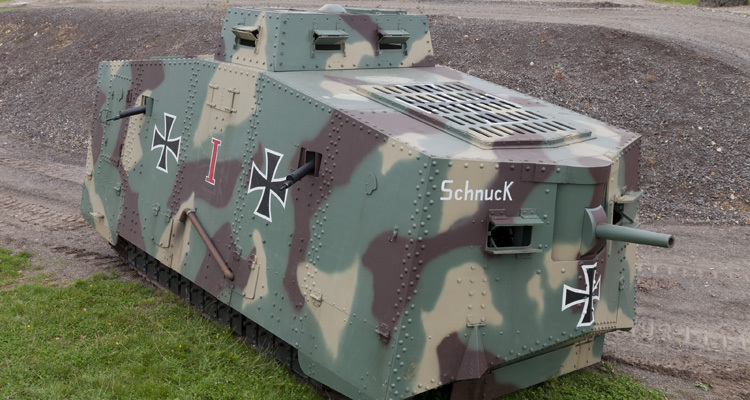 Like those later German tank designs the A7V was superbly engineered; far in advance of the British machines in their quality and mechanical sophistication. And just like some of those later designs, that sophistication would also prove to be what undermined it the most. Whilst 100 A7V’s were ordered, only 20 were built and they didn’t arrive on the frontline until March 1918. Their numbers would be dwarfed by the quantity of armour the British and French were putting into the field. 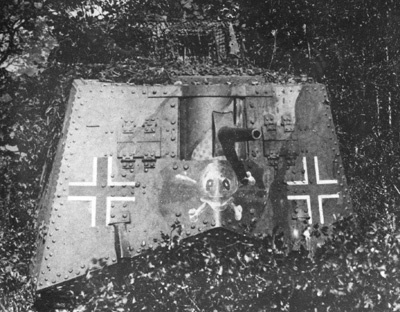 Find out more about the A7V here.